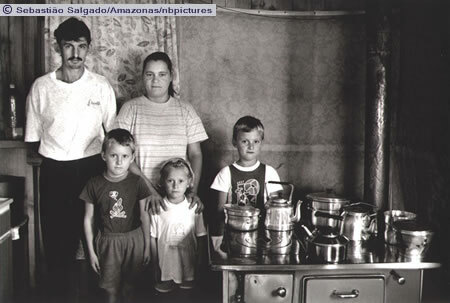 Portrait of a family inside their house at the ‘Conquista na Fronteira’ settlement. Santa Catarina, 1996. 'A rural area for the development of farming and husbandry activity. The formation of a settlement begins when the Sem Terra occupy a latifundium, demanding its appropriation for the purpose of agrarian reform, or with the implantation of a government project for the same purpose. The settlement is formed by a complex of lots that are the units of family production' (Fernandes, Bernardo Man�ano. Pequeno Vocabul�rio da Luta pela Terra. Unpublished). See also ENCAMPMENT and TERRITORIALIZATION.